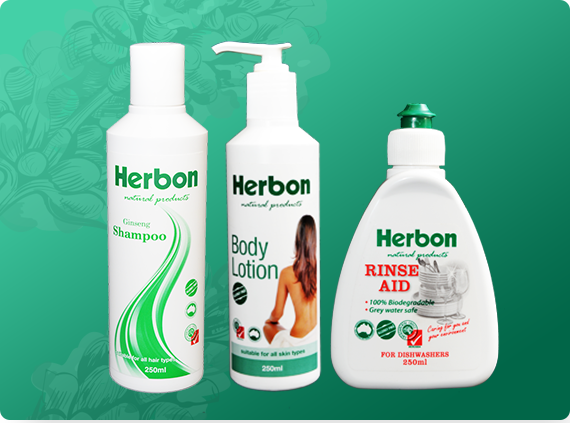 Herbon was founded in 1982 (formerly known as Puren Australia) by an industrial chemist who was actively involved in the research and development of environmentally preferable and allergy free products. Herbon Pty Ltd is run as a family business and services the Australian market through distributors to health food outlets, supermarkets, pharmacies and food co-operatives. Herbon Pty Ltd has a warehouse factory and head office in Geelong, Victoria where the products are manufactured. The warehouse facility is the primary site of manufacture equipped with a dry mixing area for all powder products and four mixing vats of varying sizes to mix liquid products. The end product is stored in the front half of the warehouse awaiting transportation. It is then distributed via road by sub-contracting transport companies to distributors who are responsible for any additional off site requirements such as selling the product. Herbon products are deemed to have negligible risk of allergic reaction. Even the most hypersensitive people have been able to use our products without reaction because they contain no petrochemicals or artificial ingredients. There is significant research evidence that our man-made world is creating an environment full of serious health hazards. Herbon through their range of products has developed solutions to prevent health problems. * Herbon products are tested by Medical Specialists and are deemed to have negligible risk of allergic reaction. Herbon products are free of Formaldehydes, Terpenes, Phenols, Chlorine, organic Mercurial’s, Balsams, Aluminium Complexes, nor natural ingredients such as Lanoline or Beeswax, which often cause skin problems. All Herbon products are *Allergy-free. Products are suitable for allergy sufferers e.g. asthma, eczema, dermatitis. All ingredients are 100% natural and do not contain petroleum based products. No synthetics, no fluoresces, no enzymes and no dyes are•	Natural ingredients are kind to hands and clothes and the *immune system. used. Natural ingredients are kind to hands and clothes and the *immune system. All liquids are phosphate free. All powders are chlorine free e.g. Dishwasher powder. All ingredients are 100% bio-degradable within 21 days, making the products ideal for people caring for our lands and waters. No formaldehyde or phenols are used. (These items can depress the immune system and/or affect the nervous system). No lanolin is used. (Often causes skin irritations). No artificial perfumes are used. All Herbon products are colour-free (Except Rinse Aid where chlorophyll is used – obtained from plants). Colour adds to risk of reactions by users. There are no animal products and no animal testing used in the manufacture of Herbon. Selected products are pH adjusted – this is strictly controlled. Herbon products are non-toxic, non-polluting and household hygienic. Waste water from washing machines may be used for your garden plants and trees. Ingredients are safe for use in septic systems. There are absolutely no fluorocarbons and therefore Herbon is ozone-safe. The plastic buckets and plastic cubes, which contain the products, are made from high density polyethylene (HDPE). Plastic used in packaging is recyclable. Herbon products in bulk containers are ideal for the home, workplace, offices, shops and the hospitality trade. Herbon is made in Australia by an Australian company. negligible risk of allergic reaction.